Toasted Ravioli done light in your air fryer. 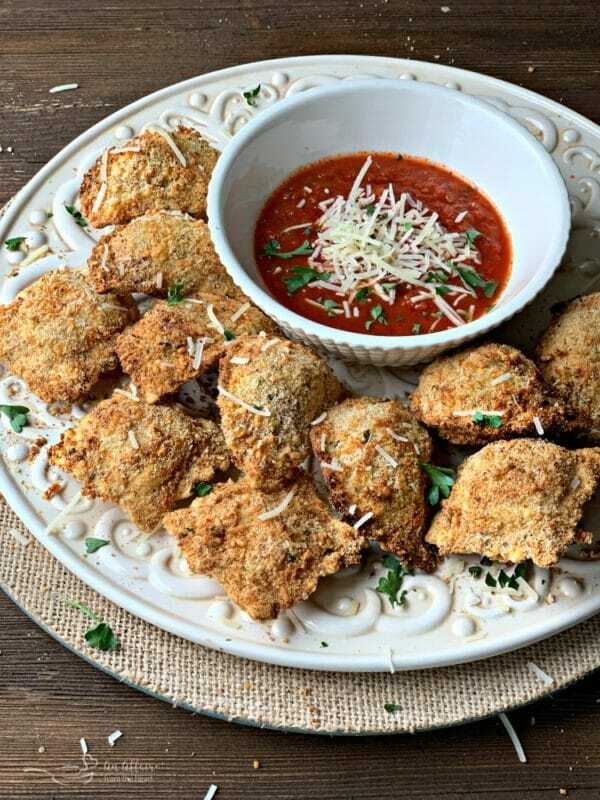 One of our favorite appetizers, made with store purchased ravioli filled with meat, cheese, or both, air “fried” and served with marinara sauce and a dusting of parmesan cheese. Air Fryer Toasted Ravioli. Yes, it’s a real thing. That favorite appetizer, typically deep fried, done light. Right in your kitchen. In your air fryer. No grease, hardly any fuss. “So, how many do we each get?” Sound like a weird question? It’s not in our family. Fried Ravioli are my youngest daughter’s favorite appetizer. The second the plate gets set on the table, she scans the table with her eyes, mentally counting who is there. Looks at the plate — divides the number of ravioli on the plate by the number of people present at the table. Then she produces the number. Sometimes down to a fraction of a breaded ravioli. Best thing you can do? Tell her you only want one and she can have the other. Watch her face light up. I have wanted to make these for a SUPER long time. I don’t know why I waited so long. I think maybe it was kismet? You see, I have wanted an air fryer for a while now. But I hadn’t let myself buy one. Then, Hamilton Beach offered to send me one! I didn’t even have to ponder what would be the first thing I would make in it. Toasted Ravioli it is!! Sure, fried food is delicious, but it’s not good for you. That’s why making these in the air fryer is genius! 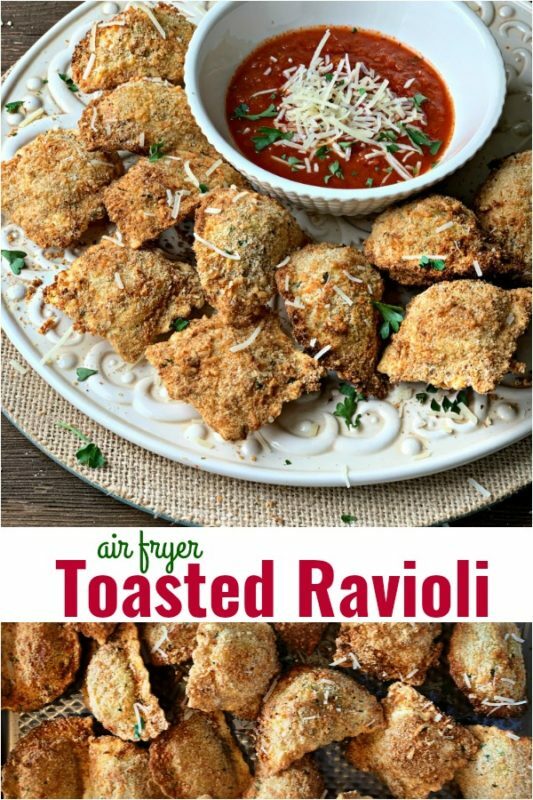 What Do I need to Make Toasted Ravioli In my Air Fryer? I bought both cheese and Italian sausage ravioli in the refrigerated section. 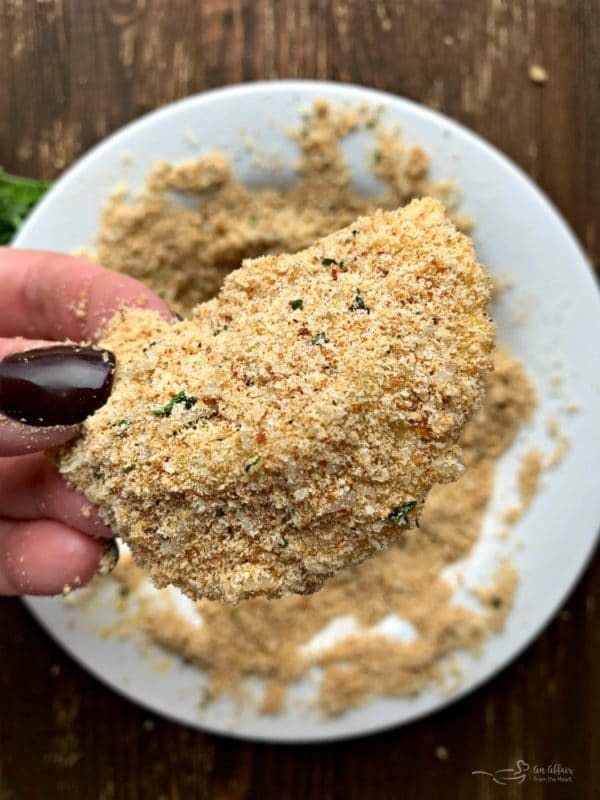 You will also need a container of Italian seasoned bread crumbs, Parmesan cheese and a couple of eggs. 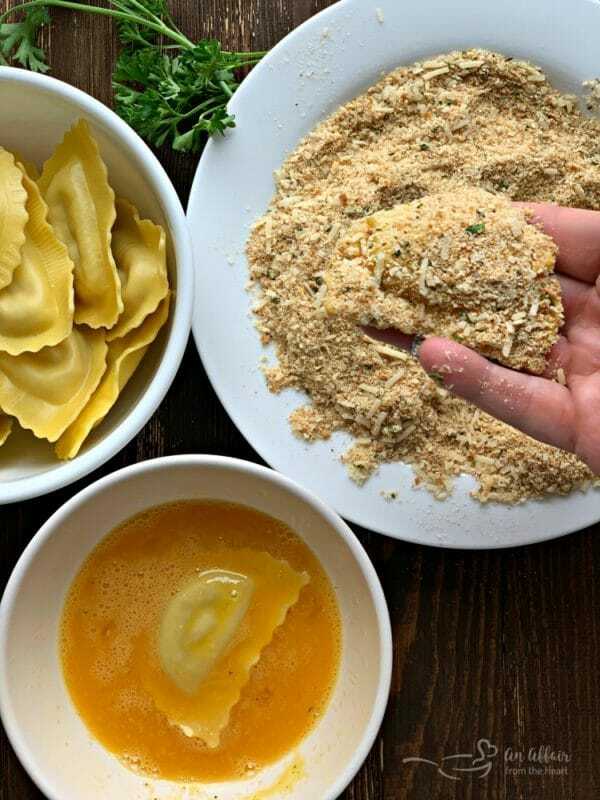 Dunk the ravioli in the egg, then the bread crumbs/Parmesan mixture. Press that coating onto the each ravioli. They are all ready to go! We are going to cook them in two batches. For this particular recipe, you want to make sure they lay in a single layer in your Air Fryer. Nine minutes, at 350 degrees. Perfectly crispy and golden brown. Plate them up with your favorite marinara sauce and eat them nice and hot! I grew up eating Fried Ravioli. It’s our favorite appetizer at my FAVORITE pizza place in Omaha, Big Fred’s. The other place that you can guarantee we’d be noshing on a plateful of these babies? The Venice Inn. Sadly, it’s no longer. But the memory of their Toasted Ravioli lives on. I was doing a little reading up on where Fried Ravioli originated, and turned out in Saint Louis, Missouri! The first toasted ravioli can be traced back to a restaurant in an Italian neighborhood known as “the Hill” in St. Louis. I played around with this recipe a bit. The first batch I took right from the package and prepped them for the Air Fryer. They were good. The only thing I noticed was that the edges were a little crunchier than I would have liked. So I tried a couple of other methods, just to make sure you could go with the one that is right for you. First, I laid them (unbreaded) in a shallow dish with a couple of Tablespoons of water, and covered them. I microwaved them to “steam” them a little while. Better. I also tried the steaming method by placing them on a plate, covering them with a damp paper towel, and covered the plate in plastic wrap. Steamed them in the microwave for a couple of minutes. Still better. 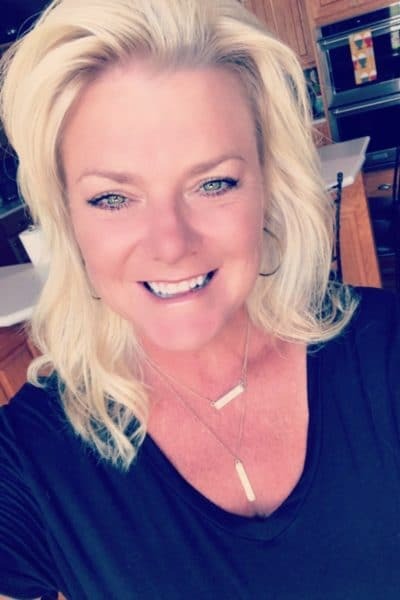 Ultimately, boiling a bowl of water in the microwave, and dropping them in the hot water for a few minutes before you batter them was my favorite way. They were just more tender, and I preferred them that way. What is an Air Fryer? Air Fryers, simply put, are compact convection ovens. They circulate hot air around a basket that holds your food. The Hamilton Beach Air Fryer is an easy-to-use countertop appliance that produces crispy food quickly with less fat than a deep fryer. Click here to purchase directly from Hamilton Beach and receive free shipping! 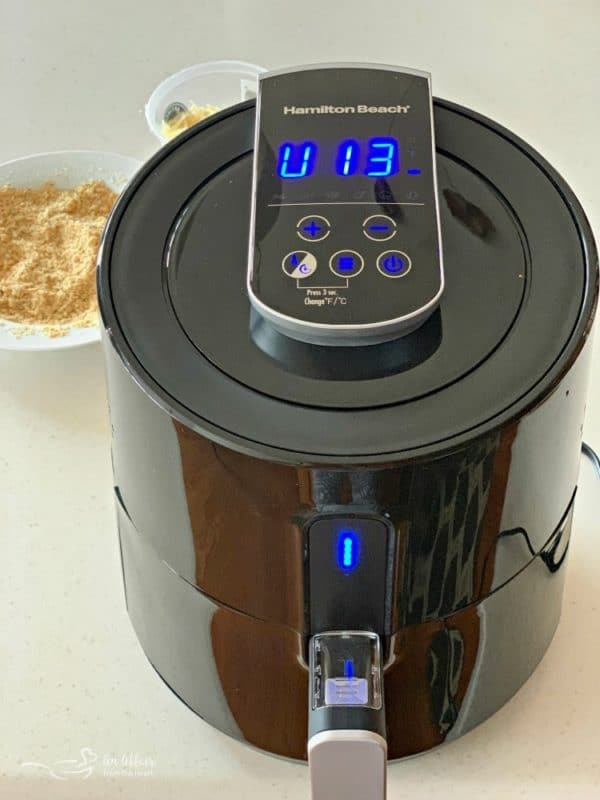 The Hamilton Beach Air Fryer would make a great gift for anyone that loves to cook and entertain! 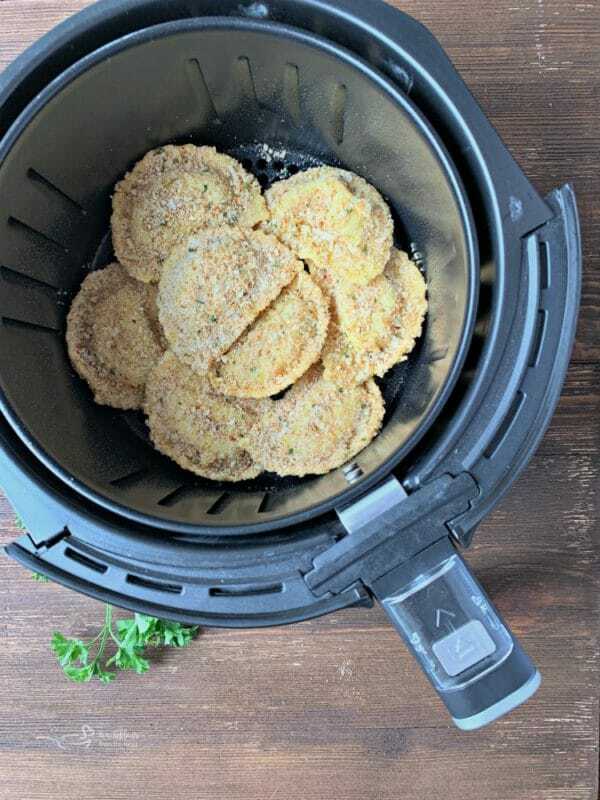 Now, let’s get to this Air Fryer Toasted Ravioli recipe! Toasted Ravioli done light in your air fryer. 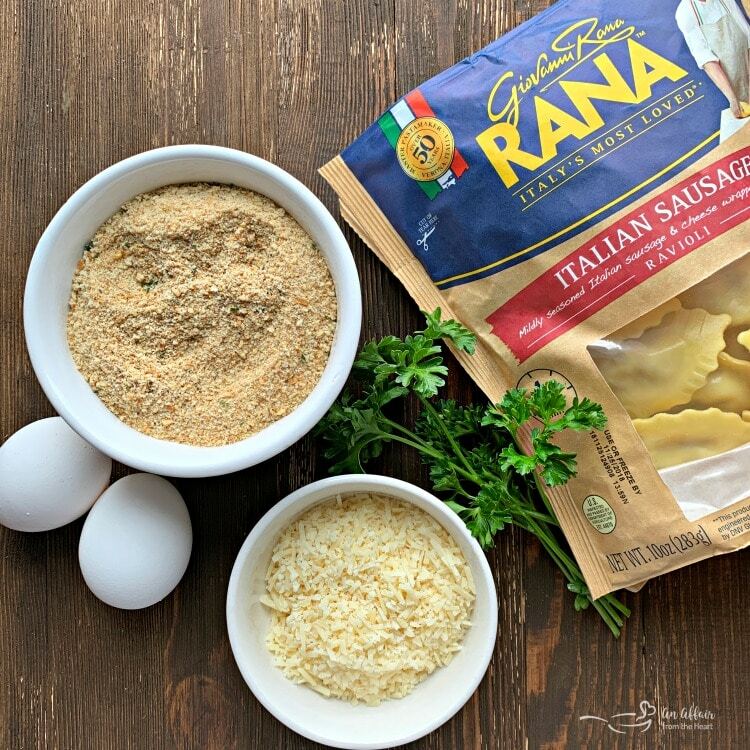 One of our favorite appetizers, made with store purchased ravioli filled with meat, cheese, or both, air "fried" and served with marinara sauce and a dusting of parmesan cheese. Microwave a medium sized bowl water until boiling. Drop ravioli in for about 5 minutes. Drain. In a bowl combine bread crumbs with 1/2 cup or Parmesan cheese. I gave the shredded cheese a bit of a rough chop. Beat eggs in a small bowl with the garlic salt. Dip ravioli in egg then press into bread crumbs, coating both sides. Fill the basket of your air fryer with a single layer of ravioli. Set to 350 degrees and 9 minutes. I need an air fryer in my life! 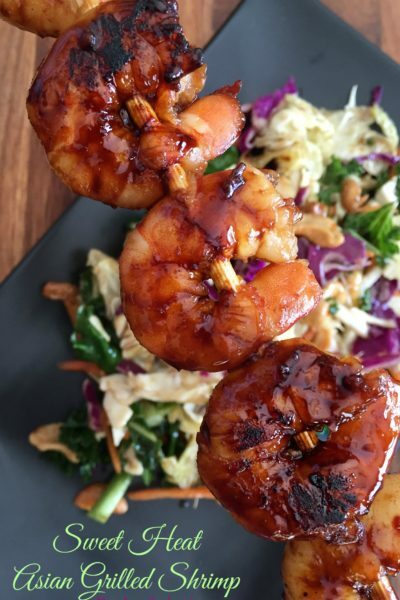 These look absolutely delicious and are one of my favorite apps. If I won the air fryer I would try making wings first then probably sweet potato fries. You know I’ve actually never had fried ravioli and I was never that sure about the idea since I figured they would probably be greasy and heavy. But like the idea of them in the air fryer as it takes away that issue! Looks tasty. I’ve never had fried ravioli but it sounds so good. 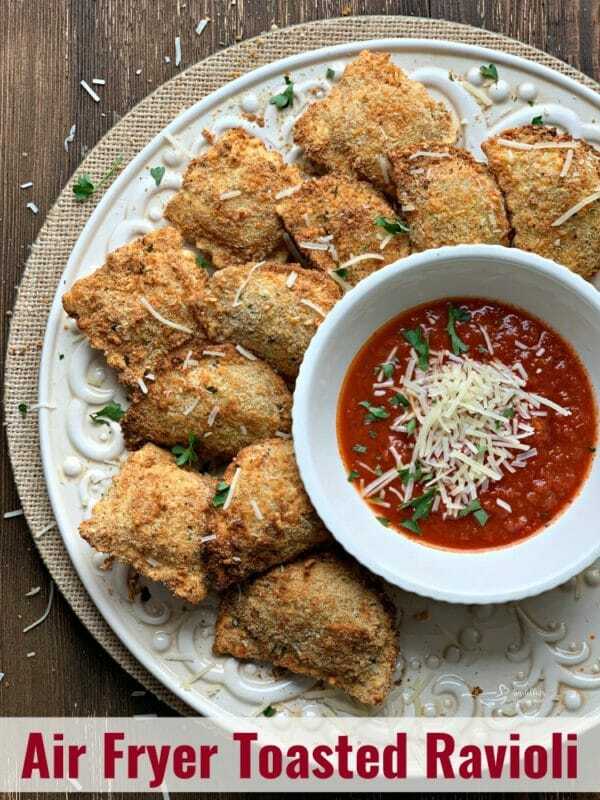 These toasted ravioli look like the perfect appetizer to serve at a holiday party. These are so delicious! Will definitely be making them again throughout the holiday season. These look so delicious! 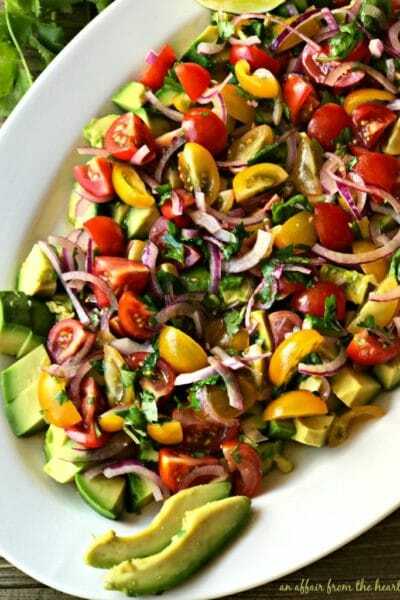 Such a great appetizer for parties! 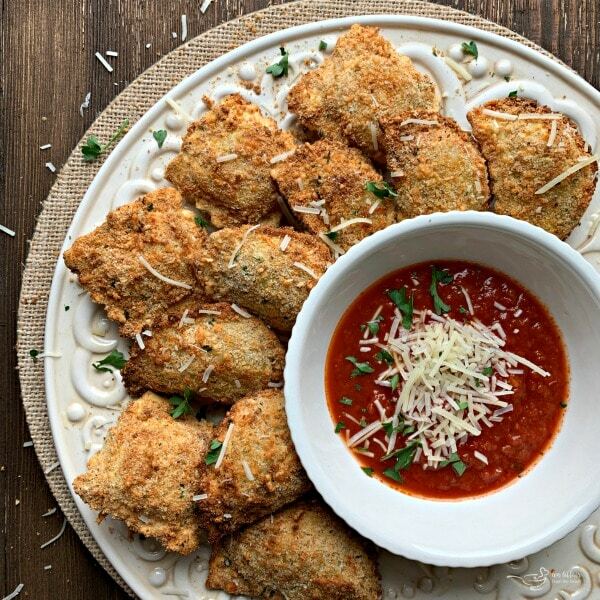 These toasted ravioli look so tasty. 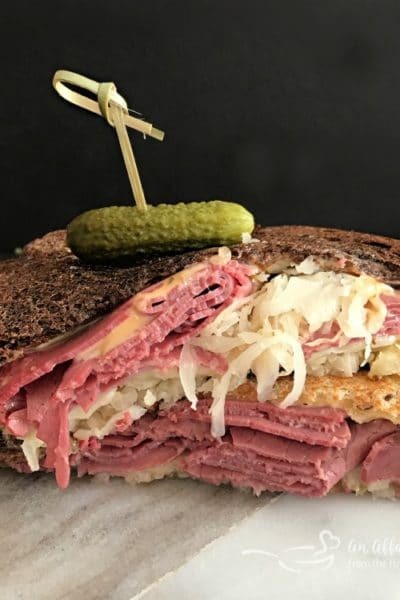 Would love to give this recipe a try. I would first do frozen French fries and onion rings for the crunchy exterior. They turn out really good! 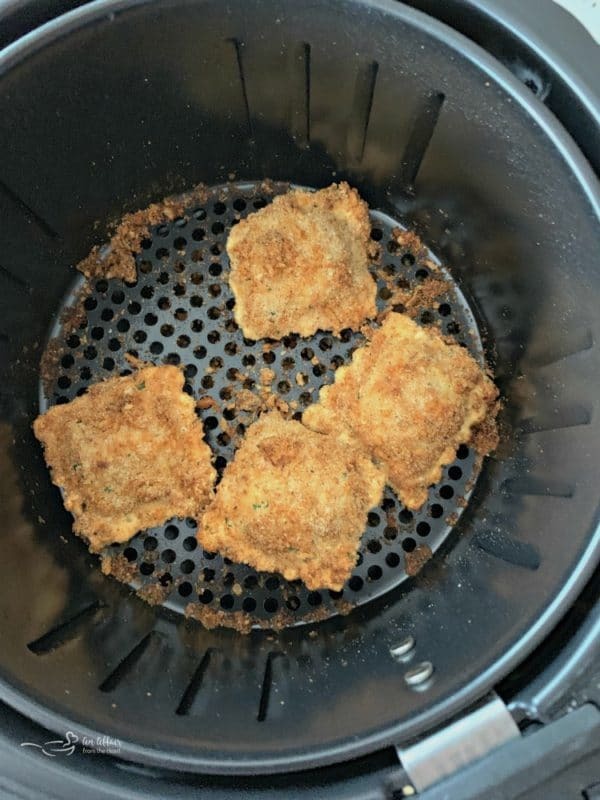 I would have never thought about this recipe in the air fryer until you posted it! 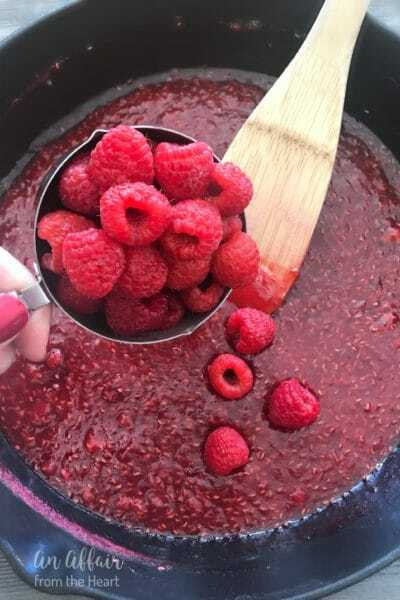 I am so going to make this ASAP! I think I could eat the entire batch of these! They look so good! These ravioli look so tasty! I have been eyeing air-fryers for almost a year now, so I’d love to win this one… or maybe Santa will bring me one! I’ve never had toasted ravioli. Great snack idea, thanks for sharing! It’s great you’ve come up with a recipe that works well in an air-fryer – I’m intrigued to try this out. I want to make some sweet potato fries! We love toasted ravioli and I love that you’ve already done the quality control for a perfect batch! I’d probably make these first if I won! These look fabulous! 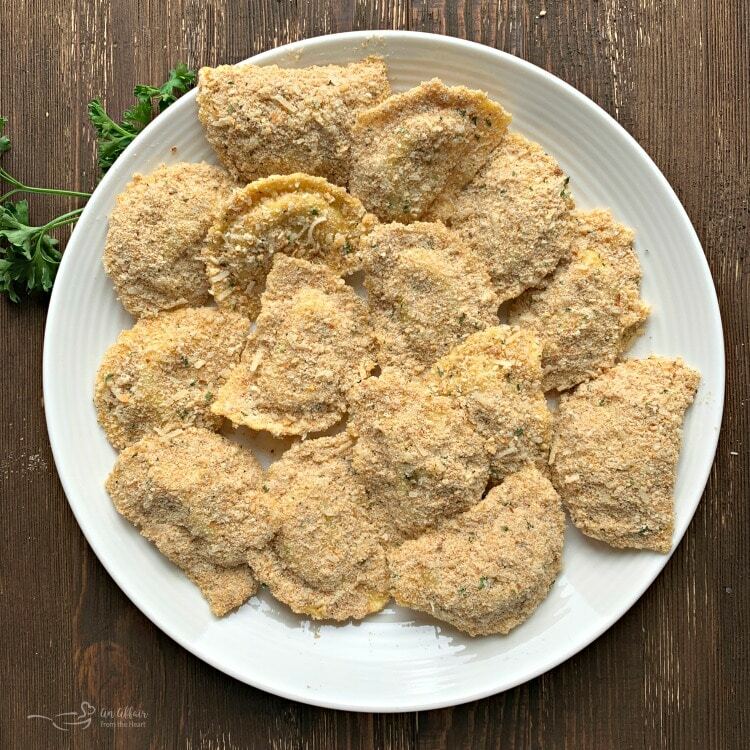 I don’t have an air fryer, but after looking at your ravioli, I think I need to get one! That looks so good!! I love fried food but I don’t fry anything because it’s not good for you! I have heard a lot of good things about a air fryer. Would love to have one!! THeae are delicious! I’m having so much fun trying new recipes. The coating on these raviolis are so good! I love fried ravioli, but quit making it because it made such a mess. 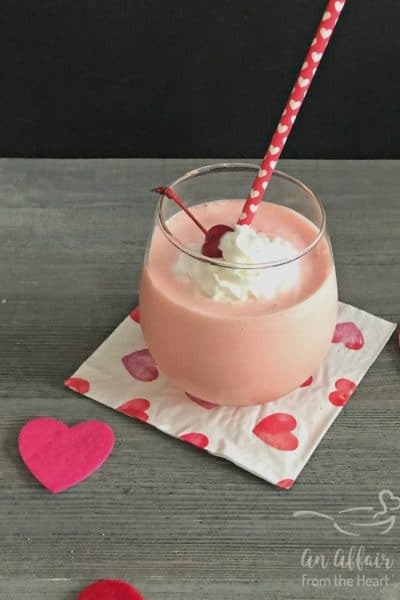 Love this recipe you’ve shared! I made it for an easy, snacky grab-n-go Saturday night and it was delicious! Thank you! 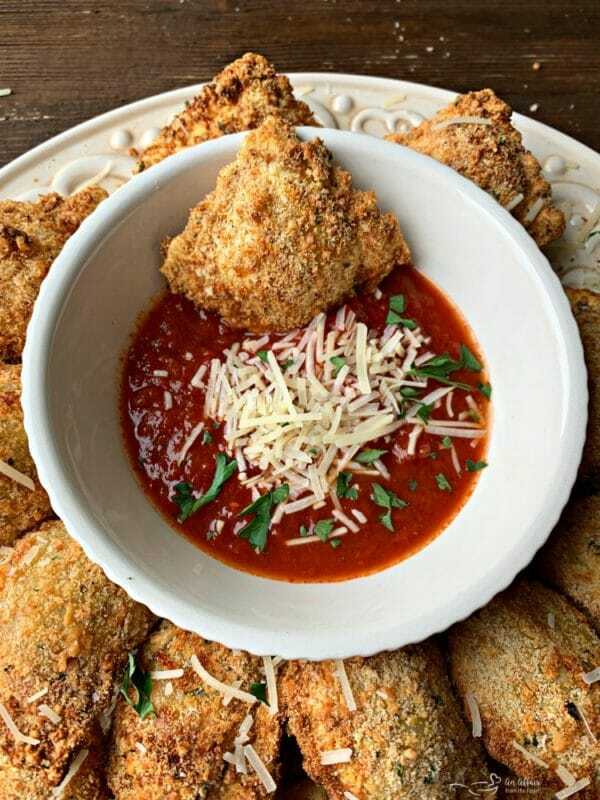 First thing I would make are these amazing looking fried ravioli! Never have had them before but they look like my kind of thing! I would make mozzarella sticks, french fries, fried shrimp, lots of things with an air fryer. Your Ravioli look delicious. I see why your daughter loves them. Addicted to chicken wings and fried chicken in general, so would probably start with one of the two or both!